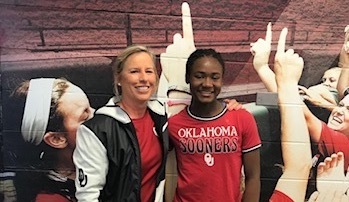 Maya Brand (right) with future Oklahoma coach Patty Gasso. Maya Bland is one of the top prospects in her class as a 5-tool player who can do everything on the field except pitch. It’s also how she feels about her OC Batbuster family and why the loss of her head coach, Mark Campbell, two weeks ago is the biggest obstacle she’s had to overcome in her life. What does it mean for you to be considered as one of the top 100 players in your grad class? It’s an honor and blessing to be considered…there are so many talented players in the 2023 class. It also shows the hard work that I’ve put into getting better and I thank my coaches and the Batbuster organization for pushing me. What were your thoughts on the Early Recruiting Change as you were one of the less than two dozen who committed before it was changed in April of 2018? I was blessed to have finalized my decision before the rule change. And I’m excited to call myself a future Sooner! For me I see both sides… there was so much that went into my decision and how OU will prepare me to become a confident, classy lady. For those ready to make that decision I feel bad for them. But I do have friends that felt the pressure of going to camps and deciding early; for those not sure and felt pressure, I feel it’s better. Overall, I feel that if you are 100 percent comfortable and you have great family support you should commit if you are ready. Talk about your recruiting journey… you’re one of the very few who committed before the changes happened in April 2018. When were your first offered and how, when and why did you commit? I initially narrowed down my college choices to UCLA, Oklahoma, Stanford, and Florida. I was able to visit three or four of these schools prior to my commitment to Oklahoma. I was first offered by UCLA, Coach (Kelly) Inouye-Perez and Coach (Lisa) Fernandez were both amazing and supportive throughout my short process. I really considered UCLA, mainly because I wanted to be close to my family and UCLA is an amazing university that could have prepared me to reach my goals in life. 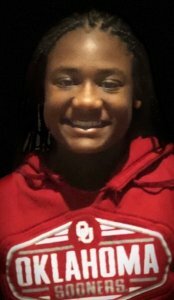 Initially, I had no plans to commit in the 7th grade; however, when I visited Oklahoma it was clear to me and my family that OU was the best fit for me. It started with the city of Norman; I realized that I prefer a small town and the people were so inviting and nice. The softball players and university made me feel welcomed and wanted and they represented many of the same qualities that my own family live by: Faith, Family and Softball. To watch the players support each other and stay true to their values were awesome to see. The potential to become a doctor and practice in Oklahoma was another major factor, the university and coaches will be there to support my life journey. Then there was Coach Patty (Gasso) and her staff—not only is she a hall of fame coach who I felt could push me to be a better player, she develops athletes into great, confident, Christian ladies! 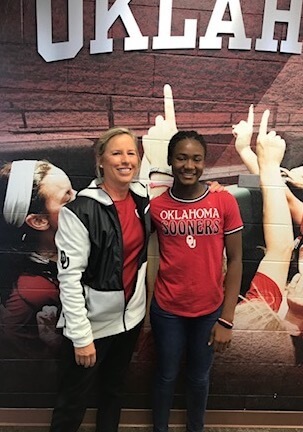 To be able to have it all and then be in a position to play softball at the highest-level made it clear that OU was the best choice for me so I committed to Oklahoma University. What did you think about the people in Norman and at the university itself?